Dearborn’s Ford Motor Co. today revealed its Mustang NASCAR Cup race car, marking the first time Mustang will compete in NASCAR’s top-level Cup racing series. Mustang’s first competition was in 1964 when it won the Tour de France Automobile, a 4,000-mile, 10-day rally. It has since raced in SCCA Trans-Am, IMSA, NHRA, Formula Drift, and NASCAR Xfinity – NASCAR’s second tier series. 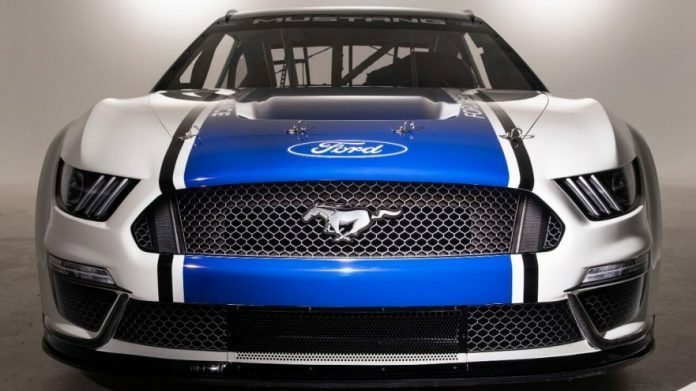 Designers translated Mustang’s signature style to meet NASCAR rules, and 13 Ford drivers will compete in the Monster Energy NASCAR Cup Series. Today’s reveal comes on the heels of the celebration of the 10 millionth Mustang off the assembly line in Flat Rock, Mich. on Wednesday.